It is no secret that competition leads to an array of benefits, including significant savings for the end user. We have seen the opposite when a company owns a monopoly on a product. Examples can range from Mylan raising the price of retail EpiPens over 400% in a very short time to dealing with customer service of the only cable provider offered in a neighborhood. Having one choice has never worked out well for consumers. The same applies to corporate relocation. A lot of relocation management companies (RMCs) either own, or are owned by, van line companies. Therefore, when a client company wants to move its employees, the employees do not have a choice of van lines. The RMC and the van line know that the transferee is at their mercy with regard to price, scheduling, and customer service. Do the pickup and delivery dates correspond with the move? Does one company estimate more crates than another? Does one company show specialty items that the other company may have missed? How close are the estimated prices? Auditing the bids ensures an apples-to-apples understanding of the van line options and helps weed out the opportunity for overages. Each carrier understands that its objective is to win the business. Therefore, they try to provide estimates that are fair and accurate with relatively no cushion to the costs. Many relocation policies that deal with van lines will also include a “not to exceed estimate” guarantee. This ensures relocation best practices are followed and provide the best solution. Companies that utilize a multiple bid process save an average of $1,547 per move! This breaks down to an average of $1,473 to $1,604 for household goods movement and an average of $175 to $289 for car shipments per move. While cost is very important, so is the transferee’s experience. By allowing the transferee to meet with multiple van lines, he or she will feel more engaged in his or her relocation process. In some cases, the transferee is actually empowered to choose the van line they prefer. Even if an estimate is slightly higher than another, if it falls within a certain percent (based on the client company’s relocation policy) of the lower bid, a transferee may select the more expensive carrier if he or she feels more comfortable with that specific household goods mover. This promotes an overall good experience, because transferees tend to be happier if they feel that they are being heard throughout the relocation process. And we all know that happy employees are productive employees. Global Mobility Solutions (GMC) is the pioneer of the “Freedom of Choice” model in relocation. By following relocation best practices and providing multiple bids for an array of providers, client companies and their transferees have saved money on services like household goods movement and, of course, mortgage loans. 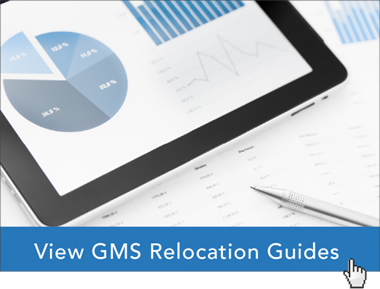 GMS continues to be an innovator of workforce mobility programs in an effort to make relocations easy and practical for clients and their employees. Learn more about the multiple bid process for household goods movement, as well as other relocation services.